It's only a Nativity - what can possibly go wrong? When Maurice and Ronald decide to stage the story of the birth of the Messiah, with a bit of help from operatic diva Leonora, they think they are creating a show well within their grasp. After all, millions of children perform the Nativity story every year so what can go wrong? But a series of unfortunate events and slip-ups ensure that instead of it being a showstopper, their production descends into chaos. It's a classic comedy plot – put together a handful of mismatched characters in a 'let's make a drama' scenario and then watch it unfold. And in fact The Messiah, written and directed by Patrick Barlow, is a new staging of his original 1983 play which was launched at the Edinburgh Fringe and went on to become a huge success, touring the country and being adapted for television. With only three members in the cast, the actors need to be top quality and Barlow certainly has that in this production. Hugh Dennis, well known for television comedies including Outnumbered and Not Going Out, is the artistic director Maurice Rose. A believer in his own thespian skills, he throws together a show which is little more than a school Nativity and then attempts to give it the gravitas of Shakespeare. Dennis is a natural in the role, capable of dealing with any unexpected responses from the audience when their participation is called for and easily able to bounce off the other actors. Best known for playing PC Joe Penhale in the television series Doc Martin, John Marquez here plays Maurice's foil, Ronald Bream. 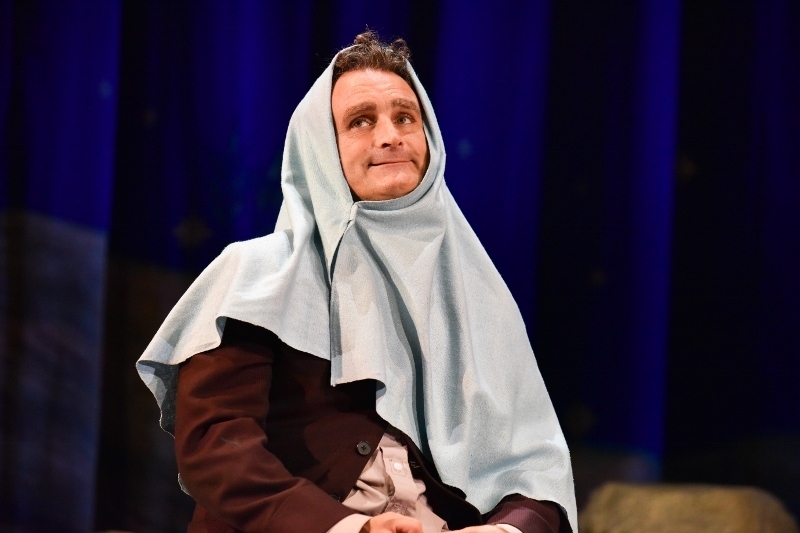 Maurice has cast Ronald to play a somewhat reluctant 14-year-old Virgin Mary despite his obvious discomfiture with the role and much of the humour comes from his awkwardness in the part. Marquez also gives a brilliant comic turn when Ronald plays the midwife called to deliver the baby Jesus and grabs the role (and the baby) with both hands. Soprano Lesley Garrettt takes on the role of Leonora Fflyte, or Mrs F, the guest star of the performance. The role gives her the opportunity to perform plenty of Handel, plus a somewhat misplaced aria from La Boheme, and there is no questioning her talent when it comes to singing. What may surprise people who are less familiar with Garrett's career is that she is also a wonderful comic actress – she is massively understated but able to reveal so much with the raise of an eyebrow or the hint of a smile. Barlow has made some adaptations to bring the show more into the modern era – the names of the characters have been changed, there's a reference to Donald…er…Duck amid the world's despots and Birmingham is given a mention or two. 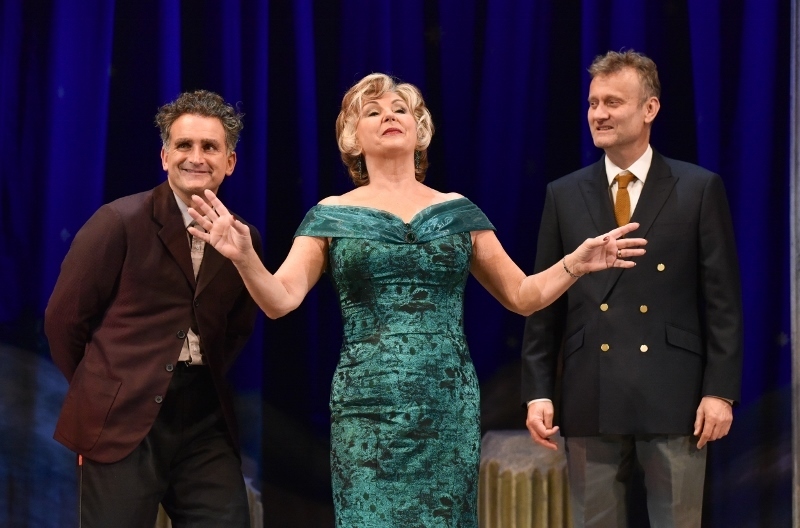 But the truth is that the 'bumbling fools creating a play' model has featured in countless comedies between 1983 and now – and in some cases in a much more sophisticated way. And so this revival does feel a bit like old hat. While the comic timing is immaculate, there are some wonderful one-liners and the connection between the trio on stage is really strong, the play itself feels lacking. When the obligatory relationship breakdown followed by individual breakdown takes place there's a sense we always knew that was coming and of course we also know it will be followed by reconciliation. Premiered at Birmingham Repertory Theatre and playing Birmingham until October 27, The Messiah then goes on tour including a turn in the West End over the festive period. As Christmas approaches this is a fun-filled show with plenty of laughs and a great cast. It's not ground-breaking but it's entertaining.